Somewhere in the course of George Miller’s magnificent Mad Max: Fury Road, the viewer may realize that they are not watching a typical summer blockbuster. This is not a cross-demographic, merchandise-generating, franchise-building exercise in how to make a uber-commercial product as worthy as possible. Rather, Fury Road is a bona fide work of art. Some artists work in paint, some in sculpture; George Miller works in automobiles and explosions. The instantly-fascinating sequence of world-building in the film’s first act tells us what we need to know: in this installment of the post-apocalyptic franchise, water is controlled by The Citadel, an efficient slave state overseen by King Immorten Joe (Hugh Keays-Byrne, who also played the villain in the original Mad Max). Defiant driver Furiosa (Charlize Theron) is sent with a convoy to trade water for gasoline; when she veers off course for unknown reasons, a psychotic war brigade led by Joe himself tails after her. Unfortunately for the bad guys, their crew contains slightly-off soldier Nux (Nicholas Hoult), who for vague medical reasons must remain attached to a living source of fresh blood. 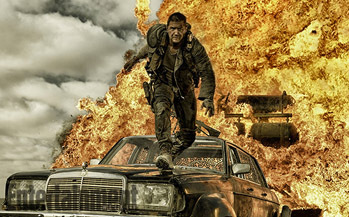 And that “blood bag” is, of course, Max Rockatansky (Tom Hardy), who has other ideas about how the day is going to go.